Although we've all been having fun posting lower-profile Alan Moore comics, we mustn't neglect the lesser-known work of other great comic book writers. Thus: Neil Gaiman's first published work in comics, from 2000 AD. "Doing the 'Future Shocks' stories for 2000 A.D. [...] was a great playground for experimenting [...] I think that if you can learn how to write a five-page story, and if you can learn how to write a lot of different five-page stories until you've really got the hang of [it]... then whatever you're asked to do later in your career, whether it's a 24-page book or a 12-issue series or a 600-page graphic novel, you'll have the basic craft and the basic notions of structure already in place. It's the best way to learn." Trigger warning for gore, although it is over-the-top, ludicrous splattergore. ...Al Ewing has written the Inhumans, he's currently writing the Hulk, but there are a couple of other Marvel teams it would be nice to see him write, yes? From 2000AD, Program 2012, comes a complex one-shot by some guy named Al Ewing. A certain British comic made a milestone event back in December. Let's take a look at a few pages from the issue! 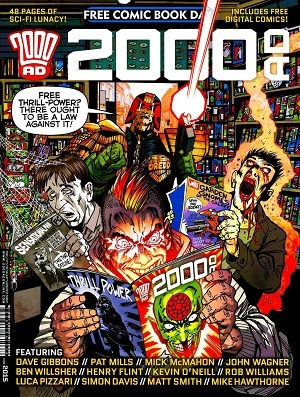 Your thoughts, comments and favorite 2000 AD memories? The second issue of John Layman (Chew) and Chris Mooneyham's madcap three-way crossover came out today, so let's go back and see how it started. Six scans from about three/four pages. Also there isn't any actual Dredd in these scans; the reason why he and the other Judges get involved deserves its own post. 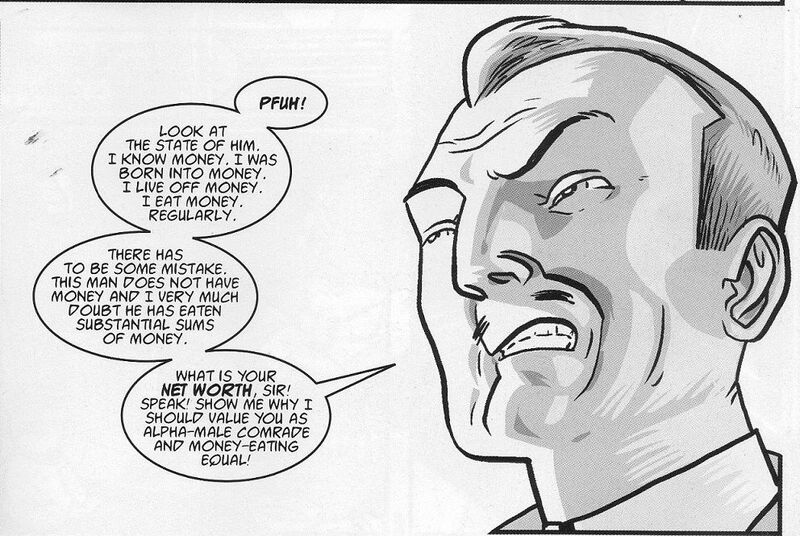 The following was taken from the trade paperback "The Complete Alan Moore Future Shocks". 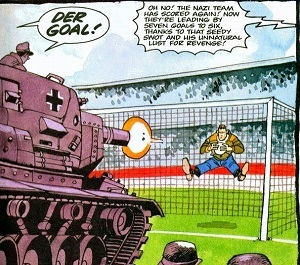 The story was originally published in 200AD Prog 331. The context is a bit different, of course, so you may just want to linger here for a while. While there's no homophobia or abuse in the images I've selected, there is in the full story. 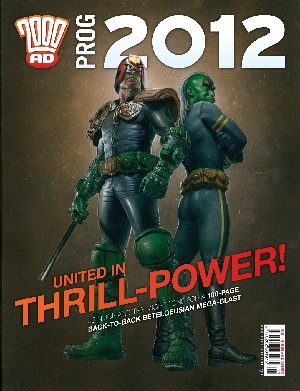 2 pages of 6 from 2000AD Prog 1817. Following on from my previous series of posts about Judge Beeny's backstory (America, America II & Cadet, Tour of Duty) some scans from the latest mega-epic "Day of Chaos". Roughly ten pages beneath the cut. The aftershocks of Day of Chaos are only just beginning to play out in the latest progs, so what the future has in store for Dredd and Beeny we still don't know. I haven't had a chance to catch up on the double-feature "moments" theme weeks just yet - but I have FAITH that it was excellent, as usual. Next theme.. first week of September? We'll see. To make up for my absence, here is a perfect TEAM moment; Pat Mills and Simon Bisley working together. On anything. But in this case, on 2000AD's Slaine: The Horned God. Slaine is, approximately, What If Wolverine Were Gambit in Mythic Ireland? Often, you see his bum. Jim Lee X-Men comics may have been how my boyfriend wooed me, but this three-volume series on permenant loan was how he kept me. Or how I knew he thought I was a keeper? Trust, man! Below the cut: Politics, dragon-fighting. Kilts. But basically, first time around, we're here for the art. More coming. Hopefully. I'm on borrowed scanner time. This is the same Pat Mills as the Pat Mills who wants to bring back British Girls' Comics, btw. Since her origins in the America trilogy (see my recent posts here and here) Judge Beeny has become a recurring character in the Dredd comics, and played a major role in the "Tour of Duty" epic. Roughly 16 pages of scans beneath the cut. Warnings: References to a mass-shooting incident. 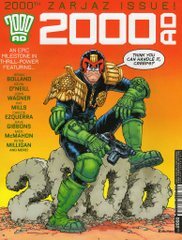 Beeny next appears in Megazine 300 in the one-off story Judgement Call, which skjam already posted some scans from here. After that comes the "Day of Chaos" mega-epic, which I'll cover in my next post. Part two of my history of Galen DeMarco, continued from here. Where we left off last time, partway through "Beyond the Call of Duty", DeMarco was making a spirited attempt at going where no woman has gone before. Here's how that worked out for her. Roughly 22 pages of scans under the cut. In a similar vein to my previous series of posts about Dredd's clone-family, I thought I'd put together a bit of a history of one of my favourite supporting characters, Galen DeMarco. This is the first of two posts; the second should hopefully be up later in the week. Roughly 19 pages of scans beneath the cut. In part two: Dredd's reaction, what happened to DeMarco after that, and an appearance by another awesome female character of the Dreddverse. Content Warning: Not really NSFW, but - THIS IS A "BIG DAVE" STRIP. 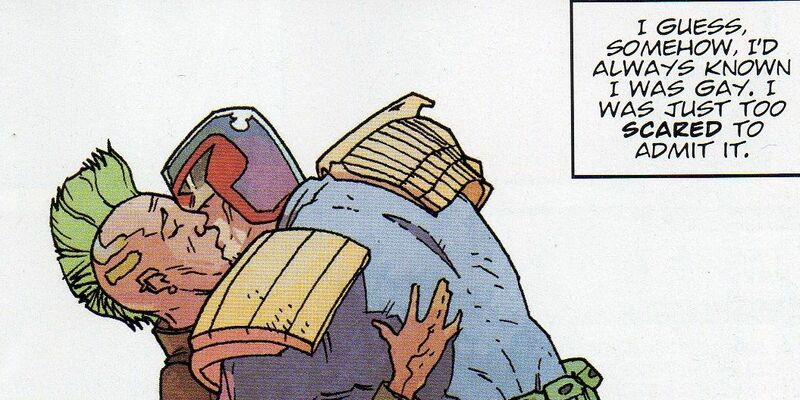 Current Music: Throwing Muses, "University"
More Dredd! The third and final part of my series of posts on Dredd's family. (See links for parts one and two.) A tale of terrorist plots, cloning experiments gone wrong, Christmas gatherings and tea breaks.